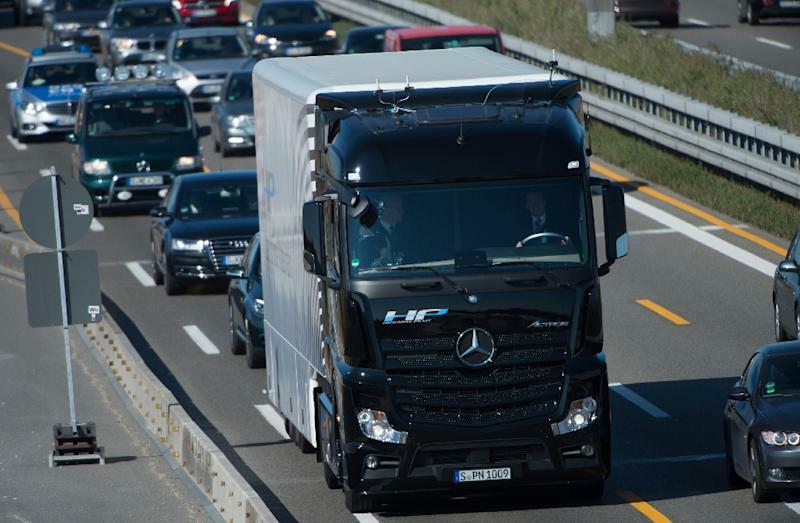 Berlin (AFP) - German automaker Daimler said it trialled a self-driving truck under real traffic conditions for the first time Friday, on a motorway in southern Germany. "Today's premiere is a further important step towards the market maturity of autonomously driving trucks -– and towards the safe, sustainable road freight transport of the future," said Wolfgang Bernhard, board member responsible for Daimler Trucks and Buses. A totally self-driving truck, without the need for human monitoring, is still a long way off. Daimler compared the Highway Pilot to a plane's autopilot. It is able to steer the truck by itself, while the driver "retains full responsibility, needs to monitor the traffic at all times and must be able to intervene at any time". The system includes front-mounted radar and a stereo camera, as well as Daimler's Adaptive Cruise Control system. Should the weather or the road markings deteriorate badly, the system prompts the driver to take over the controls with audible and visual signals and, if the driver fails to respond, brings the truck to a stop automatically.